Nyack is going to have a really fun day when a giant water slide comes to town. 1000 feet of slick,wet vinyl will be set up on Main Street between Midland Avenue and Franklin Avenue. Make sure you bring your water buckets, water goggles, and squirt guns, to slide and splash in Nyack. 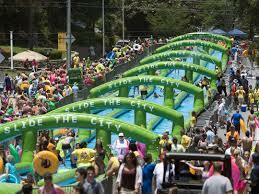 The event takes place August 27 and the cost for a three hour window of time to slide will be $35. Whether you bring your family or friends this is sure to be an incredible experience for all alike.